Your actions can help reduce the spread of graffiti vandalism in Edmonton. The City of Edmonton promotes safer, cleaner communities by reducing and preventing graffiti vandalism. 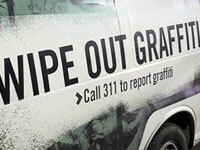 The Graffiti Management Program implements a number of initiatives to ensure that graffiti is removed promptly. Use our self-service reporting tool, to report graffiti on either public or private property, this will help to ensure the Graffiti Management Program is aware of the vandalism and that the graffiti is removed promptly. To help speed up the response time and provide further details about the issue and location of the concern, you may attach a photo to the request. Examples of public property are: City structures, City stairs, City recreational facilities, benches, bus shelters. You can also call 311 to report graffiti vandalism or email 311@edmonton.ca. The City assesses the request and cleans up the graffiti where required.